A Slow Cooker Chicken Cacciatore Recipe using loads of tomatoes, peppers, onions, and mushrooms. A delicious variation of traditional Chicken Caccatorie your family will love. If you read the blog, you know I love my slow cooker (or as we call it here in the midwest – the crockpot). I give this kitchen gadget props for helping busy moms get healthy meals on the table with no sweat. I am also a little obsessed with crockpot chicken recipes, I have tons of them here on the blog. 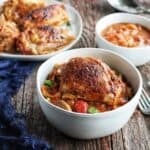 Crockpot chicken thighs are used most often like in the most popular recipe on the blog Crockpot Chicken Thighs recipe, Coconut Chicken Thighs, and Baked Chicken Thighs. Seeming the chicken thighs are very cost effective and easy on the budget, and that they are uber kid-friendly, I make them a lot. That’s how this Crockpot Chicken Cacciatore recipe got developed. I needed a fresh recipe and a different flavor. Combine diced tomatoes and tomato paste in the bottom of the slow cooker. Add sliced onions, peppers, and mushrooms. Sprinkle with paprika, salt, and pepper. Cook on low for 6-8 hours or high for 2-4 hours. Remove chicken thighs, placing on baking sheet. Broil for 2-3 minutes, or until chicken skins start bubbling and browning. Whisk instant potato flakes into tomato and veggie mixture in the slow cooker, stir until thickened. Serve chicken thighs topped with tomato sauce. To get started gather all the ingredients. Place the diced tomatoes and tomato paste into your crockpot. Add the onions, pepper, and mushrooms followed by the chicken thighs. Top with seasoning and cook. Here’s what this dish looked like after cooking all day in the slow cooker, before being placed under the broiler. Once the chicken is cooked to an internal temperature of 165 degrees you can preheat your broiler. Kitchen Tip: Placing the crockpot chicken thighs under the broiler crisps the skin quickly. If you are going to be removing the skin, you can skip this step. Broiling chicken thighs after they have cooked in the crockpot all day, crisps the skin and makes it all the more delicious and more appetizing as well. A quick trick I love using to thicken sauces is to use dry potato flakes. Potato flakes thicken sauces quickly without having to use a roux or flour. What To Serve With Chicken Cacciatore? Delicious side dish ideas include Caramelized Butternut Squash, Zucchini Crisps, Cheesy Mashed Potato Bites, or a Brussels Sprout Salad. A Slow Cooker Chicken Cacciatore Recipe using lots of tomatoes, peppers, onions, and mushrooms. A delicious variation of traditional Chicken Caccatorie your family will love that is easy to prepare. We will be making this delicious recipe frequently! My whole family loved it!